Wellness for the World: Constipation...uggg! So why would I say "ugg" to constipation? Well, because if you are constipated "ugg" is exactly what you would feel like. There is one important fact discuss at the beginning here and that is to define constipation. Most people think that one bowel movement per day is actually healthy. Guess again. One bowel movement per day is actually still constipation. Understand that the time frame from when you eat your food to the time this food exits your body, should occur in 18 hours or less. So with that said, one bowel movement per day will hold the residual of approximately six meals in your digestive tract at all times and most of this would be impacting the colon. Even if you are moving more than once per day but your movements are arduous while releasing small "ball like" waste, this would also be constipation. Also recognize that it is not unlikely for those with constipation to cycle back and forth from constipation and diarrhea. To go one step further, if you would like to reach optimal bowel movements, you would have one shortly after each meal. If this seems unreal to you, think about an infant. Feed a baby, poop, feed a baby, poop. Get it? While this is not always the favorite subject to discuss, this is often invaluable information to have. So what's the big deal if your constipated? Some may feel that this is going to release in good time any, so why should I be concerned? That's a great question that needs to be answered. The big challenge here is tied into toxicity in the body. First understand that your liver is the body's primary organ of detoxification but does not have an exit out the body. Your liver actually dumps toxins into your colon for eventual but relatively swift removal. This is of course if you are actually moving your colon optimally which would be a minimum of two health, easy bowels movements daily. Now if the colon is not moving optimally, there are some real challenges and here's why. The colon itself is designed to be a transport unit and not a storage unit. The walls of the colon are permeable and if residue and toxins remain impacted in your colon for too long, or one bowel movement daily or less, you will then reabsorb the toxins and residue from your colon into the tissue and eventually back in your blood to be disbursed throughout your body. I understand that this sounds like an issue in itself, but there's more. Let's look deeper at what's going on in the liver. When toxins go through the phase I liver detoxification, these toxins are converted from a fat soluble form into a water soluble form so they can easily be released into your colon. When this conversion occurs the toxins are actually now more toxic than they were in the first place. This issue of course is if your living with constipation. If you are these "more toxic" toxins are reentering your body, getting into your blood and wreaking havoc on the cells of your body. I trust that this is enough information to motivate you to reach the goal of two or more healthy bowel movements per day. So how do you do this if you are a one or less person? 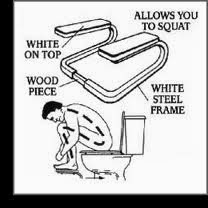 Follow these tips and you are likely to see improvement in your bowels movements. If you follow these tips, it is likely that you will improve the flow of your colon and live a less toxic life. If you follow all of these recommendations and you still find yourself constipated, this would be a time to look into either coffee enemas or colon hydrotherapy with someone that is an expert on this level. Enjoy your healthy bowel movements! Why Would YOU Need Probiotics?